GBT013 is a local bandage as a decoy for the excess of proteases present within the wound. Chronic wound is characterized by an excess of proteases maintaining inflammation and leading to an absence of healing. We hypothesize that an excess of metalloprotease substrates will result in an inhibition of protease present within the wound which will in turn results in a faster healing. GBT013 is a medical device and act as a decoy for the excess of proteases present within the wound. 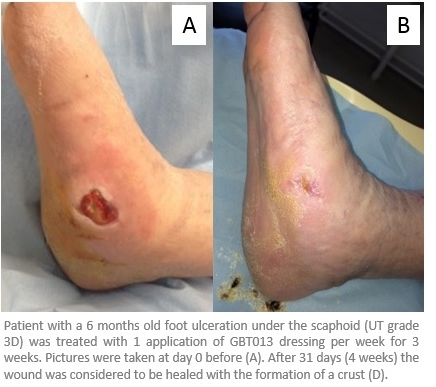 Diabetic foot ulcer: a chronic wound. Diabetes, a chronic disease, is projected to be the 7th cause of death in 2030. Evolution of the disease can lead to many various pathologies such as obesity, cardiovascular diseases, nephropathy, retinopathy and diabetic neuropathy. Fifty per cent of diabetic patients will develop a neuropathic disease. Diabetic neuropathy and peripheral vascular disease are usually the main factors involved in diabetic foot ulcers. Approximately 15-20% of diabetic patients will develop a diabetic foot ulcer on his lifetime. Foot complication in diabetic patients cause a substantial economic cost to any health care system. 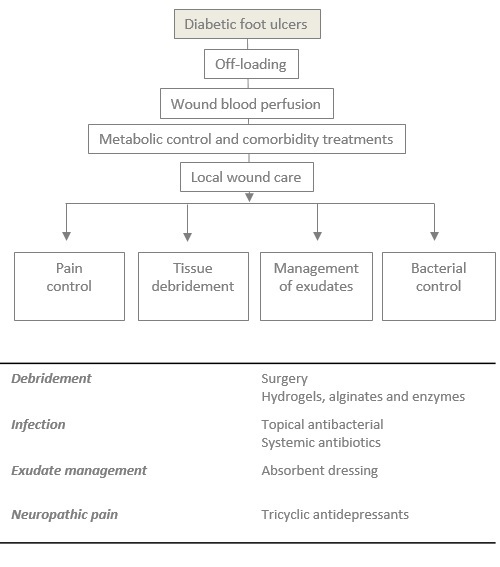 Healing time is a key parameter in chronic wound treatments as any delay will increase the risk of infections, which in the worst cases may lead toward amputation. Post first amputation, mortality rate of diabetic patients reach 50% and 70% within the 3 and 5 following years, respectively. Every year, around 4 millions of diabetic people develop a new diabetic foot ulcer. This may occur as well in type I diabetes or type II diabetes. The number of people suffering from diabetes is affecting more than 4OM people worldwide and treatments are still unsatisfactory. The perfect treatment should not only cover the wound and manage the exudates, but also must correct the pathology responsible for the onset of the chronic wound. UDP treatments include: the control of the patient metabolism, debridement and off-loading, control of potential infections, vascular insufficiency and a modern, integrated approach of wound care. Dressing are usually used in DFU treatments. Cost can be drastically different (hydrocellular, hydrocolloïds, alginates, association of silver to the dressing…). None has proven a better efficacy than the other on DFU healing. GBT013 is a tridimensional matrix mainly composed of collagen (CE# 2198138CE01 & 2198138DE01). 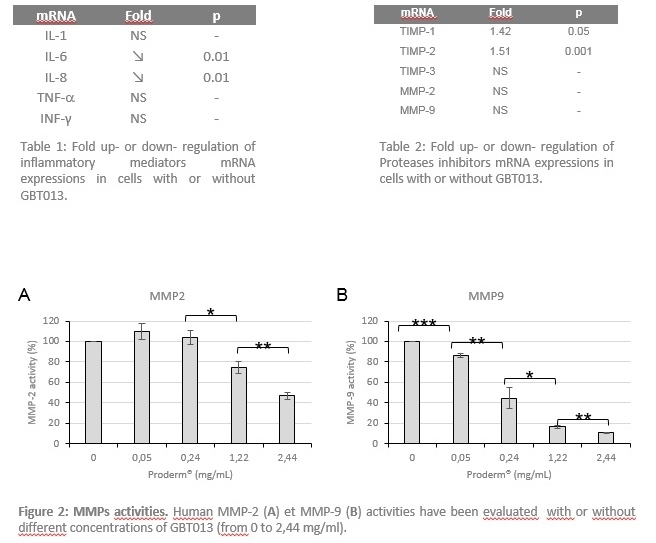 GBT013 constitutes a substrate which inhibits excess of metalloproteases present within the wound to induce faster healing. Collagen acts as a decoy for the excess of proteases present within the wound. · Biocompatible and biodegradable tridimensional matrix allowing cell colonization and proliferation. o Collagen is a main component of the skin promoting elasticity and tone. GBT013 is a dermal equivalent acting as a dressing that will correct the biochemical parameters of the wound. GBT013 is indicated for the treatment of second and third degree severe burns ans for the treatment of chronic and traumatic wounds and for reconstructive surgery. This medical device is a regulated health product that bears the CE mark as per the legislation. Class III Medical Device.